***With a Kona in the background for good measure! I didn't know Blue was brindle! WOW, gorgeous! haha... yea, Blue is blue brindle. His brindle is really starting to show up. Also, I meant to mention this, Blue is incredible fast! He runs unbelievably fast for a Mastiff puppy! what do you mean no need to litter the forum with their spam? !, lol. You probably have one of the cutest but most intimidating alarm systems around. Blue is busting out of his puppy mold, holy crap! There is a great level respect and natural power your guardians seem to have, for one another and themselves alike. You guys are doing a great job raising Masha and Blue! Ah! Blue is brindle! NICE! but I cannot covet him- b/c I know he is way too much dog for me. I love his last photo...and I love his natural ears. My daughter says he is "cute to the very last pixel!" That last picture of Blue literally made my heart melt!! I do know that a dog w/ a taller rear-end would be seen faulted in the show ring. Blue will grow out of it, his earlier pics show him level, his rear has just recently gotten taller (and his head looks small right now). I have no idea what find of issue a dog w/ a tall rear-end could face, but my guess would be shoulder, elbow, and spine issues. Really, conformationally speaking, Blue will not be perfect - for example, Blue has VERY round eyes, they should be more almond shaped. Blue's breeder pays less attention to confirmation and more attention to workability, temperment, and health. The breed has horrible hips, but Blue's are almost perfect as his dad's (and mom's) are +90% for PennHip (which is great). Blue's father throws the round eye fault (I think it comes from the Dane), but he also throws a perfect (real) Cane Corso temperment (which is what I wanted). Mojo, Blue's father, can jump into the bed of a Ford F350 with the tailgate up - that's pretty amazing! That's a big jump! I think his eyes are beautiful. thanks for the knowledge about growing really big dogs (RBDs)! and I am glad to know Blue's hips are great. I didn't mean to imply anything defective, just needed improved information about how these big guys legs grow, which I knew you'd know better than me! Well I do know that dogs with high hips can be very fast with little repercussions . If his parents are good in the hip dept. I would not worry too much about being straight across the back. But do know that some dogs with great hips can and do throw dogs with fair hips or even poor. So excellent mating to excellent is not a 100% guarantee. Overall you have to look at % that meets at least good. It just is not an exact science when it comes to hips. I think more genetic research has to be done to narrow down the odds and where the genetic markers are located. Certainly we will know more probably in another 10 yrs and as more data becomes available. Oh I forgot to mention ....I think temperament is so important, more than absolute perfection in conformation. What's the point of having a dog if you can't live with them and enjoy them at a very base level, which really revolves around a good personality. My thoughts exactly, what do you mean "litter" the forum with their spam? Aren't you forgetting something extremely important? You know that all (if I'm not mistaken) of our members are very passionate about dogs, right? Just with a special interest in the Japanese kinds -smiles-. Yeah, I noticed the brindle coming through on Blue. I think I've "said" this in another thread, but Blue is looking so mature now and "almost all grown up like." Still a handsome boy! That's cool that Luytiy is using a cooling den too! If I stand corrected...he preferred to stay on top of it rather then inside it. I love the last photo of Masha & Luytiy...Masha especially looks very cutesy! The second picture and the last picture of Blue are stunning! He's such a looker! I love Masha's Mask. Is it common with the breed for the black to be so strong? The second picture of L he's like "Everything is in order Sir. I've got it covered." Invisible ears...it's the new CO fad, didn't you know? >> It's common in the Reds, like Masha. The red color COs have some special traits. The mask does show up in other colors too tho, but the red COs have a more distinct one (like Masha's). I'm sure it's been answered somewhere else, but are the CO's ears cropped somehow? >> As Corina said, they are cropped. They usually crop the ears of CO at 4 days old. This helps prevent them from freezing in the winter or from being torn by a predator in the event that have to engage one. Blue is gonna be a big boy! Brad, that would explain why I'm having a difficult time finding any photos of a CO with a natural ear set. As Lindsay points out there is a unique movement for each breed. Dog steps by Rachel Page Elliott helps illustrate and visualize the gating aspects in canines (comes in DVD too). To clarify my comment on the the high hips.... I am referring to the coursing breeds where high hips are not as big of an issue when seen in an adult. How high the pitch in regard to the shoulders with each dog without problems that is a good question. In mastiffs high hips in adults can produce some mismatched pacing from front vs hind end loping and side winding once the weight distribution changes in maturity. Ditto on what brad said earlier.... blue is young and there will be high hips until his growth plates close as he balances out and settles a bit. So no worries at this point as he runs about in glee . I still stick by my point about temperament though and really for an average dog slightly high hips are not the end all and be all and does not really detract from having a nice companion or a decent working dog. Everytime I see pics of Luytiy & Masha, I think I would really like to cuddle them, even knowing (especially having met) that it isn't possible. They are just gorgeous!! Yeah... I know what you mean LJ. They look like snuggly wuggly bears that just need a hug. Luckily, I know better, should I ever have a run-in with one lol. Awesome! Thanks for that photo. I admit that they do look more "approachable" with ears! And more like dogs, less like a bear, lol. With or without ears though, they are still beautiful dogs. Masha really reminds me of her mum / dam! I love seeing Big L & Masha side by side like that. Get a real feel for their similarities & differences! Awww, Funny Luytiy! He is too cute. Luytiys gas face is one of the best faces ever. Looks like Miss Masha has found herself a whipping boy! Luytiy's face having gas is Hysterical! It's funny to see him not serious! And Masha pulling Blue's coat, he has a lot of extra skin to grow into huh?!?!? Yikes. I love the jumpy picture of Luytiy! He's adorable, which is a bit of a tricksy look for him as he's a guardian, disarm them with his cuteness and then scare the crap out of you with his veracious barking! I also love the Masha/Blue picture, perfect face on blue for the situation haha. That cool den is so... cool! I was reading about earthbag building recently... I bet that would make an awesome cool den. I'll have to try it out. Regarding that den, do you have issues with snakes finding it attractive? I really like the idea, but I'm leary about rattlesnakes hiding out in it. Blue is beautiful! His light eyes give him a surprised look, but his loose skin makes him look worried. My dear Blue, you have never looked as brindley handsome as you do right now! Wow, he is huge now! How big is he? How big is he supposed to get full grown? Brad, I LOVE that first picture of Blue in this last set. The light seemed to hit his face just right. Thanx for the complements!!! I thought these pics came out really nice. Blue is 75lb now! That's 5lb less than Hilo!!! He should top out around 120lb. There's a dog show this weekend. Since I can't go to WI, I'm going to it. I was excited to see that there are supposed to be 2 Cane Corsos at the show. I will - Normally I'm just there for the shibas & akitas, but when I saw that there were going to be CC, I wanted to hang out for a little while. Lutity always seems so happy. I think he is pretty happy, he's got his "flock" and acreage to guard, the weather is cooling down, and he is not crated 99% of his time... I think he has the life he wants. I hope that's the case anyway. I must not be checking in on this thread enough because I missed the one with Masha chomping on Blue. HUGE LOL to that one, it's maybe my favorite pic ever. Blue's face is just asking to be captioned. I never thought about this till you wrote that, Brad- Liutiysaurus Rex guards the flock of dogs & the yard, what's Masha's guard duty? Does she defer to Liutiy and let him be the captain of Guard so she can play, or does she have other guard responsibilities? What's Blue's guard duty? He's not a flock guardian, right? Does Blue guard the house more than guard the flock? if they are property/acreage guards are they less guardy off-property? 1) They are considered less dog aggressive than many of the LGD breeds. 2) They are very agile, hardy, and rugged (good for living outside in the cold). 3) CO have served as both property guardians and LGD for thousands of years. 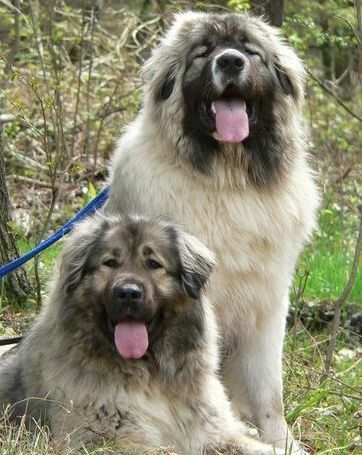 4) [Most important] Masha's breeder (Luytiy's importer), Stacey, was the only breeder I spoke to (out of 20+ breeders of various LGD breeds) that was totally confident in her dog's ability to guard our dogs without issues (like dog aggression). I originally decided I needed an LGD because we had Coyote in our fenced area, Eagle and Hawk swooping down for Kona and Maui, as well as numerous encounters with Mountain Lion tracks around our home. So, I was looking into ways to protect our dogs and felt protecting our dogs with a dog was a natural fit. Jen and I spend a good amount of time on the trails in the Mountains around our home (the southern Rockies), in these areas there are many Black Bear (and I have been warned by forest rangers that they are human predatory) as well as many Mountain Lion (4 attacks on humans this year, 3 last year all within 5 miles of our home). So, I also wanted a dog that could hike with us for protection (this is another reason for my draw to the agility and strength of the CO). Stacey had imported Luytiy for breeding and felt he was a good fit as he showed no dog aggression and was very sweet and kind. She was willing to place him in a home that would work with her if she wanted to breed him later (Luytiy's pedigree is very nice). She offered other prospects to us but Luytiy seemed like he was the best fit (good age, kind, not dog aggressive [...] ). Then the question came up (by Jen): What happens if we are hiking with our LGD and a predator comes to get the dogs at home? Well, the answer is simple: We get 2 CO! LOL Stacey agreed that we could also purchase a female puppy from her, that is/was Masha. Turns out Luytiy is exactly what Stacey said he was (kind to family, not dog aggressive, very sweet), but Luytiy is also a very typical Russian bred CO - VERY sharp toward strangers and a bit hard-headed. He is just too much of a Liability to hike in public areas. That was ok tho, we had Masha to raise to be a great trail dog, and we are still doing that. So the plan now is for Masha to be our trail CO and have a light guarding duty at home and Luytiy is our primary property / flock guard. Luytiy is out side 24/7 on duty and really seems to love his job - he shows GREAT judgment now and has really grown into his role. Masha is much more trainable than Luytiy, and has had a lot of socialization in public and on trail. She is just as sharp as Luytiy, maybe even sharper in some ways, but she has a great base layer of training. So the plan is still a good one for our COs, not the exact one I had in mind but still a solid plan. So where does Blue fit in? This summer we noticed that Masha was rather hot on our hikes and so I started thinking a short-coated breed would do better for trail protection in the summer. Do we really need one? No, Masha would have been fine but I had always wanted a Mastiff and really liked Cane Corso. Blue's breed has some interesting qualities, they are what pulled me more toward the Cane Corso as a Mastiff than, say, the Tosa Inu. Cane Corso are used heavily for personal protection work, they are used for this type of work because they are VERY trainable (like a GSD). They also don't roam, so they can be off-lead in the back country and not disappear on you (can't say this for the CO). They are also a coursing Mastiff, which means they love to run and jump, this lends itself nicely to the role of a trail dog (in old days, the rich would use them to run along side the stage coach and protect them from "highway men"). Blue comes from some of the BEST working lines in North America, his father is by far the most titled CC in America. His breeder has produced CC that are on the Police force - they are a true working kennel. Blue has a very high-drive temperament and a natural gift for protection work. He is very obedient and VERY efficient in the role of personal protection. Does Masha defer to Luytiy and let him be the captain of Guard so she can play, or does she have other guard responsibilities? >> Not really, if something goes down outside she is (or wants to be) right there with him doing their job together. Traditionally LGD work in pairs or small groups. Masha is way more trigger happy than Luytiy, I think this is a maturity thing. Does Blue guard the house more than guard the flock? >> Yes. If one of the dogs is hurt (like when Kaia hurt her hip) Blue was totally oblivious while the COs whent on full-on guard mode. if they are property/acreage guards are they less guardy off-property? >> Yes to Masha and Luytiy (tho Luytiy more than Masha, he only guards things he is 100% comfortable with). Blue will guard Jen (and me) anywhere (and our property too). This is a pretty hi intensity guard setup when you think about it. >> It is utter and complete over-kill (to be frank about it). Luytiy or Blue or Masha alone would be enough if each one could preform all duties properly (or as needed). There is another level to the overall picture tho - our dogs are pretty well known in their niche on the internet, and I am pretty public about our home and life. So, it's nice to know that the dogs and us are protected from any crazy internet people. Also, Taos is a strange place, it's very safe, but at the same time we are only 5 miles from an area called "The Mesa" - it's a lawless and scary place. The road we live off ends at the Rio Grand Gorge where there are hot springs, many of the people that live in the area called "The Mesa" (close to Carson, NM) come here to bathe - they are mostly runaways and transients and some do not have the best intentions. Having said that, my neighbor keeps their doors unlocked and has never had an issue - so I can not say that they pose any real danger to us. And I haven't nodded to the watch dogging of Kai Ken Kona- but I wonder how you'd describe the difference between watchdog vs guard dog among each of these guys? LGD bond closely with the flock and protect them, they are not necessarily property protectors - they go where the flock goes and protects them. Property guards do exactly what it sounds like they do. They will guard anything, and everything, including (but not limited to) children, animals, people, wood piles, cars, shoes, houses, factories, you name it, they will guard it. Many property guards are Bandogs (aka "chain dogs") and spent most of their life chained to the item they were meant to guard. Both CO and CC (as well as other breeds like the Tibetan Mastiff) were on chain at one time in their history. A lot of the breeds used as property guards today are actually split into 2 types: LGD & Chain Dog. The CO, TM, and CC are examples of this. In the CO their were the LGD lines and the factory / town guarding lines, same applies to the TM. For the CC their were "Hay Dogs" who were chained to hay bales and protected the hay from robbers, "Pig Dogs" who roamed with the pigs and protected them, "Goat Dogs" same as Pig dogs but for goats, and "Butcher Dogs" who would drive, bait, and hold the bulls for slaughter by the butcher. Then their are alarm and watch dogs, these are usually smaller breeds that bark a lot. Interestingly many of the guardian breeds had a little alarm dog breed that was deployed with them. The alarm dogs would sound the alarm and the big guardians would come in and do their job (as the guardians were usually sleeping or walking their territory line). For the TM, the Tibetan Spaniel was the chosen alarm dog paired with them and for the Cane Corso it was the Volpino Italiano (similar to the Pomeranian). lol, well, it's A LOT of information! It's really interesting stuff...especially when one is looking at their own pack. I've got my alarm dogs and a guard/protection dog. No need for a guardian/livestock dog quite yet. I may be needing to get a couple in the future though (when I get some property) and, as of yet, I have no experience with LGD. So it's nice to get your experience/perspective/research/knowledge on them. So, Romi met Luytiy on Friday, we actually let him out in the yard with her in the yard - but separated by a fence. He did ok, really I was impressed by his judgement. Tho, as we moved closer to him he started to guard more heavily. He's a big brute. Romi knows some Leos that go to the daycare she works for and it was interesting to hear her comparison. She said Luytiy was more fluffy and thicker but about the same size. Brad, I actually found all that information quite impressive and interesting. Thanks for sharing! Wow, that was really great info-I read the whole thing. Leos and L about the same size, huh? I've been thinking about adding a Leo as my "big outside dog" so that's really interesting to learn a little more about LGDs. *edit- ha, "crazy internet people", you mean like the kind that can't go a day without checking the forum? Love the pictures and all the information...what I truly love is when you see your pics you get the sense that these dogs are truly happy and living a great dog life :) !! How do akita compare in terms of watchdog/guard dog at home and on the road? Before I began to learn from the forum, and your akita story specifically, I'd have broadly thought 4 akita would be plenty of security for anyone...and there's that whole bit about "a kai will defend you with it's life." Is that not quite true or practical? Did the addition of Liutiy comfort the other dogs- do they alarm any less with him on duty? "Oh, well, Liutiy's not worried about that noise, so I wont worry..."
Well, I had a lot of fun reading your story of Lyutiy's kindness and sweetness... Because his name mean "angry, temperamental and ruthless" in Russian. Did you know it when you take the dog? It is a good name for guard dog, I suppose. I always wondered what Big L's name ment! That's a pretty intimidating name. I'm glad some of you enjoyed the info, I was concerned it was too much but I felt it was necessary to give the background info before I answered the questions. How do akita compare in terms of watchdog/guard dog at home and on the road? >> They make OK Alarm/Watch dogs and their size is usually enough of a deterrent to keep an intruder out. They are not Guard dogs tho, this is a popular misconception. I think this issues comes from the difference between AA and JA. Though I have little experience with AA (I do not own one), I have heard that they can be a formidable guardian. With our Akita Inu (JA) I see a lot of strength, territorial-ness, and watchfulness but I do not see any "man stopping" qualities. Ours are either too soft, or too fearful to preform that type of role. Having said all that, this is based on my experience with the 8 or so JA I have met (4 of them I live with) and the 4 or so AA I have met. Before I began to learn from the forum, and your akita story specifically, I'd have broadly thought 4 akita would be plenty of security for anyone...and there's that whole bit about "a Kai will defend you with it's life." Is that not quite true or practical? If you are looking for a largish dog that will bark at an intruder and can look rather intimidating, sure an Akita (or 4) is more than enough. If you are looking for a dog that will engage any intruder AND be able to stop/retain them, then I am not sure the Akita, as a breed, is where I would look. I'm sure there are Akita that can and would do this, but as a breed I don't think that is a foundation skill - as apposed to a CO or a CC, who is at their core a "man stopper". If you are looking for a dog that will autonomously patrol their territory, actively warn off predators, and engage threats when needed an Akita will not fit the bill, IMHO. Our Akita are not interested in spending huge amounts of time outside. If given the option they want to be inside, sleeping on the couch or whatever. They also seem to hate being out in the dark, as soon as it's dark they are inside. Our CO, on the other hand, prefer to be outside, and Luytiy seems to prefer to be out at night. Both Masha and Luytiy will actively patrol our property line and will warn off threats. Our Akita will bark at threats if they happen to be over in that area of the yard, but they do not actively search for them. As for a comparison between CC and Akita, they are a bit more similar in the way they prefer to be with their owner, but again CCs are "man stoppers" while Akita are more the "bark and bluff" type. *The reason none of our Akita meet our "trail dog" needs is because they are horrible on trail - they hate water and mud. Try crossing a stream on trail with an Akita - it's hell! They also tend to get hot in the summer (more than the CO even). In a situation where you need a protective WORKING dog, one that has a "mission critical" role, I would trust a breed that has been used for (and was designed for) the specific purposes and not hope that in a serious situation your Kai, Shikoku, or Akita will own up and do the job. I feel like that would be putting those dogs in a situation where they had a larger potential to fail than to succeed - and that's not fair (or humane, IMO). Well, I had a lot of fun reading your story of Lyutiy's kindness and sweetness... Because his name mean "angry, temperamental and ruthless" in Russian. Did you know it when you take the dog? >> Yes, I did know what the term "luytiy" meant, and it's a perfect descriptor for Luytiy's temperment if you are a stranger. Luytiy was from Tskaro's "L" litter out of sire Monomah so his litter all had names starting with "L". Brad that was really great info! You have some great dog knowledge and I am so glad you share it with us! What a great write up. I too enjoyed reading it all, and it didn't seem long because I got so into it. I did kind've wonder how you ended up with so many guardians. lol. I am also enamored by the CC. Being Southern Italian, we were raised to have so much respect for the breed and their ability to take care of their owner. I have always known that I will have one someday. Haha Brad you should write a book (or update your blog!). I tend to find most 'informational' stuffs to be pretty boring but this was pretty interesting. I can't imagine how much work you guys dedicate to raising the dogs. Even I think it's tough taking care of two shibabas. Living in a college/ghetto town, it's tough feeling safe even with the two doggies (+1 temp shiba). Their barks definitely do not portray as 'big dogs in the house so stay away robber'. I definitely would not feel safe in the middle of nowhere like where you guys live if I was alone. At least you guys thought ahead of time before anything bad happened! Thanks, that's why I ask the questions- b/c I know you've got the answers. "Haha Brad you should write a book (or update your blog!)." The Blue running pic is sweet!!! Wow, Blue is getting big and looking very handsome! I love his eyes, they are so stern but also very sweet. Masha is super cute, I still just want to throw my arms around her and cuddle her like a teddy bear! Masha looks like such a fluffy bear. Blue is funny, he looks like he is maturing but still look so much like a puppy to me. I love the first pic of Masha, she is so cute in it. Masha is winning me over :) . Wait, I think she already has long before! Blue has such a range of expressions in his eyes. I love how in one shot Blue is the "Guardian" and in another shot he is "sad puppy face eyes"...he is just amazing! Those eyes... he seems really smart, or maybe just observant? He has very beautiful eyes, but it's hard for me to tell what he's thinking. "He has very beautiful eyes, but it's hard for me to tell what he's thinking." - Please give me food. - Please let me out. - Please pet me or something. Blue's way cool looking. His eyes seem different than most Cane Corso's. Well, the color of his eyes is diluted (like the color of his coat), but also his eyes are rounder than they should be per the CC. Corso should have a more almond shape eye per the standard. Tho a round eye is not a huge fault in the show ring. Blue's breeder (a working kennel) actually prefers the rounder eye because the typical almond eye is very prone to "Cherry Eye". They have never had a round eyed Corso get "Cherry Eye", which is good since an illness like that can take the dog out of it's role (it's job) while they are surgically fixed and then heal. While they have had a few correct eye shaped Coros get "Cherry Eye". So they breed their working dogs for a rounder eye. It was interesting until I decided to google cherry eye and watch a video of the surgery. Why do I do that to myself? I like his round eyes better. Instead of blending in, they pop. You can't help but stare at them in the pics. This video is pretty interesting, from a behavioral standpoint. The guardians "arguing" over a Kong and a Antler Bone. This is 100% dog, no humans around to interfere with their behavior. The dogs are so powerful, and so big, and yet they are so gentle with each other. Also note how much more "bossy" Masha is compared to the boys, this is a common theme with our dogs - the girls are really bossy while the boys are kinda passive. *Not the greatest video, but you get the point. Let me ask you, if something came into your yard that the guardians perceived as a threat (like a coyote or person) do you think that they would just try to kill it or work towards scaring the threat away? "Let me ask you, if something came into your yard that the guardians perceived as a threat (like a coyote or person) do you think that they would just try to kill it or work towards scaring the threat away?" >>>> Well, this is not an easy question to answer. The short answer is that a threat would be scared off before it entered our yard, and so this type of situation isn't very realistic. The one thing to keep in mind is that an LGD just wants you to leave. If an LGD is ever barking at you, they are asking you to go away and not to proceed onto their property. All you have to do it turn around and walk away, they will not pursue you (like Blue might). An LGD's M.O. is basically "shock and awe", that is their main role and mission. They want to scare off a threat by making a lot of noise and a big display, and in most circumstances they are very effective at this, and their "job" ends there. With CO, they use their bark as a warning to not approach their territory, and use a "bark and lunge" bluff to frighten a close threat off (like the UPS guy at our door). First, a note on how hard it would be to sneak up on Luytiy: He knows when our neighbor's friend walks over to their house. He cannot see their house well (due to our fence), and the house is far enough away so that he doesn't hear the stranger walking up to it, but he smells the man before he even turns down our street (400+ feet away). Rick, our neighbor, can walk to his friends house and then walk back to his house and Luytiy will just watch at the gate, not making a sound - if he has a friend with him - or if his friend walks over alone - Luytiy will give a very serious warning to him. This is how amazing his sense of smell is. If it was an animal that ignored the warnings or snuck into the property, the COs would make a lot of noise and charge the threat. The threat would more than likely flee, if the threat ended up standing it's ground or getting cornered and fighting back, our CO would attack - if it was a canine (like a Coyote), I'm pretty sure they would kill it, if it was a bear or a large cat, I think they would probably not go for kill and just "bay" the threat there until it figures out how to leave the property or I come out to figure out what to do. They would certainly attack the larger threat if it attacked them first. If it was a human that ignored the warnings or snuck into the property, I would guess it would go very similarly except that the first line of defense would be to knock the person over and then hold them there (standing on them). If the person just continued to lay there the CO would snarl at them until I came out, if they decided to fight back then they would be bit and chased off. You would have to be a very stupid person to continue into the yard once warned, and if you are so mousy quiet (and odor free) that you could sneak in without the COs knowing - which is really not likely as they small everything - then the pure shock of surpring a CO would probably lead to some serious injuries for you. The COs are at their most extreme when surprised. An LGDs final action is physical confrontation. From my experience it actually takes a bit to get them there, they would prefer to just scare the crap out of you. On the job, it wouldn't be very effective for the LGD to physically confront a threat every time - they wouldn't survive very long doing that. Then there is Blue, he is a Personal Protection dog. Blue is a lot different, and is some ways more scary. He doesn't charge the fence line when there is a threat spotted, he just stays in his position and growls until you are close enough for him to make an attack. He gives little warning, and will just burst into a sprint right up to you barking and being very intimidating. If you just stand there, and ignore him, he will stand there and bark at you. If you make a sudden movement toward him he will jump at you and force you down. Blue is probably quicker to bite than our COs are as he seems to crave the combat (the physical confrontation), while the COs just want to be scary. If a dog entered our property, and Blue was on the job, I'm pretty sure that dog wouldn't be leaving our property alive. Having said all that, if WE bring a new dog in, the COs and Blue don't really care. The Shikoku and Shiba are the ones that get nasty about that, even if WE bring the new dog in. That first video is really interesting. It seems the living situation your dogs are in produces excellent social skills. Seeing the three of them interact with "limited resources" is a fantastic example. Perhaps the most interesting part of that video is the standoff around 0:22. That's the type of situation that you would probably see escalate among either more reactive dogs (I'm seeing Joey in particular here, or probably even either of your Shikoku based on the brief meeting we had in Madison) or poorly socialized dogs. But for Blue and Luytiy, it was a calm moment of clear communication. Blue was clearly in a position to grab the antler with his head lower than Luytiy's. Luytiy applied calm but assertive (forgive the invocation of Cesar's mantra, but I can't think of more descriptive words) pressure to Blue, maintaining his head position above Blue's. When Blue concedes a few seconds later, he doesn't completely give up. He stays close, keeping his head low respectfully and keeps contact with Luytiy. It's almost like he's saying "fine, you can have it but I'm not happy about it." That video was exactly what I needed to see this weekend - thanks for posting! Wow, it's so amazing how many different ways a dog can defend and protect. btw, Masha looks so much like a lion in the first video. "Having said all that, if WE bring a new dog in, the COs and Blue don't really care. The Shikoku and Shiba are the ones that get nasty about that, even if WE bring the new dog in." Um, I'm no expert, but I think they would get used to it, tho the younger you started them on that the better. The way I take it is, our Shikoku don't want to fight new dogs, they just want to be very clear on the "rules" of the house and, more importantly, their "rules" of engagement. Once that initial excitement period is passed it's fine... So I think the object would be to manage the initial intros (first 48 hours or so), since that is where most issues will come up. From our experience, the initial shock of the new dog creates the majority of the hysteria. Even off property, just walking Blue, if he is surprised by a dog his reaction is terrifying while if he knows to expect to see a dog his reaction is a lot less. Aww! The 'Luytiy & mom' shots are so sweet! Blue is really starting to get his non-puppy serious face. He's such a good looking dog. But I really love how he's running and the akitas are in the back like "Really, dude? We're going to go chill over here ... tell us if some cheese needs chasing and then we'll help." crap. I've been spelling Luytiy's name wrong this entire thread. Sorry big fella.